The "sleeper" hit in the 'year of the independents,' was nominated in eight categories and won in four major categories (Best Picture, Best Actor, Best Director, and Best Screenplay for Paddy Chayefsky). It was the first Best Picture Oscar winner to also win the prestigious top prize honor (known as the Palme d'Or at the time) at the Cannes Film Festival (Best Picture-winner The Lost Weekend (1945) won the Grand Prix award earlier), but brought weak box-office profits. The film had originally been a small-screen TV play (with star Rod Steiger) that aired in 1953. On the bigger screen, the ninety-one minute film also had the distinction of being the shortest Best Picture winner in awards history. [The next shortest Best Picture winner was Annie Hall (1977).] It was the first Best Picture winner based on a play written for and previously produced for television, that was transferred to the big screen. It was also the first American feature film to be shown in the USSR (in Moscow) since World War II, during a 1959 cultural-exchange program. Delbert Mann's win as Best Director was a remarkable achievement, since he was competing, in his first major directorial assignment, against veteran directors such as Elia Kazan (East of Eden), David Lean (Summertime), Broadway director Joshua Logan (Picnic), and John Sturges (Bad Day at Black Rock). 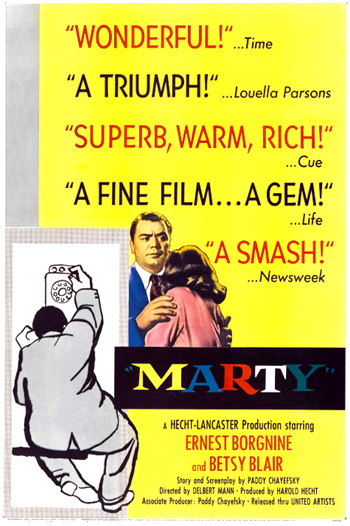 [Bad Day at Black Rock, a critically-superior film, was defeated in each one of its three categories of nominations - Director, Screenplay, and Actor, by Marty.] Only two of the Best Director-nominated films, were also Best Picture candidates - Joshua Logan's Picnic and Delbert Mann's Marty. 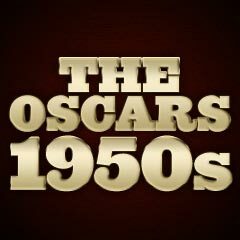 Both the Best Actor and Actress awards in 1955 were given to Italian characters! Another of the Best Actor nominees was the legendary actor James Dean (with his first of two career nominations in his first starring role) for his magnetic, sensitive performance as rebellious adolescent Cal Trask searching for love and acceptance in a film adaptation of John Steinbeck's novel - a melodramatic telling of the Biblical 'Cain and Abel' story in East of Eden (with four nominations and one win - Best Supporting Actress). Dean was killed in a tragic car accident six months before the awards ceremony - he was the first actor to be nominated posthumously for an Oscar. (A second posthumous award would be awarded to Dean the next year for his nomination in Giant (1956).) Therefore, Dean was the first and only actor to receive two consecutive posthumous Best Actor nominations. And there were two Italian performers among the Best Supporting nominees (Sal Mineo and Marisa Pavan). Sal Mineo (with his first of two unsuccessful career nominations) was also nominated for his role as the confused and suicidal teenager Plato in director Nicholas Ray's Rebel Without a Cause (with three nominations and no wins). An Honorary Award was presented to the three-part Japanese epic film Samurai, The Legend of Musashi, directed by Hiroshi Inagaki - as the best foreign language film - first released in the US during 1955. Many fine pictures in 1955, which were at least as good as the Best Picture nominees - but un-nominated for Best Picture - included Rebel Without a Cause, Bad Day at Black Rock, East of Eden, the animated Lady and the Tramp (completely overlooked, especially for its potential Best Song nomination for Bella Notte ("She's a Tramp") sung by Peggy Lee), and Richard Brooks' Blackboard Jungle. The troubled teen-James Dean film, a tale of youthful defiance, Rebel Without a Cause also lacked a Best Director nomination for Nicholas Ray. Actor Charles Laughton's only directorial effort, the brilliant thriller The Night of the Hunter was totally ignored by the Academy and although it bombed at the box-office, the film was eventually considered a critical masterpiece. The un-nominated film provided one of Robert Mitchum's greatest performances as crazed, murderous and perverse preacher Reverend Harry Powell (with finger tattoos on each hand who reenacted the struggle between H-A-T-E and L-O-V-E in a memorable monologue, and sang "Leaning on the Everlasting Arm"), and one of the last performances of silent star Lillian Gish. Sidney Poitier was overlooked as Gregory Miller, a disaffected, inner city young black student, in the urban drama Blackboard Jungle, as was Vic Morrow - portraying the insolent, delinquent gang leader Artie West. Tom Ewell was also missing from the acting nominees for his role as neighborly Richard Sherman opposite Marilyn Monroe as The Girl in The Seven Year Itch. Director Robert Aldrich's greatest film - the brutal crime film Kiss Me Deadly, did not receive a single nomination. And Douglas Sirk's radical, soap-operish melodrama All That Heaven Allows with performances by Jane Wyman and Rock Hudson, was completely ignored by the Academy. Picnic, one of the Best Picture nominees and a film with a total of six nominations, featured three un-nominated stars - William Holden, Rosalind Russell, and Kim Novak. Henry Fonda, as Lt. Doug Roberts, the first officer of the cargo ship - the major title-role star in the comedy Mister Roberts, didn't receive an acting nomination (although he was recreating his character from the Broadway stage version). And although Cagney was nominated for Best Actor, it wasn't for his better role in Mister Roberts as the power-mad and despotic Captain Morion. Raymond Massey as James Dean's strict father in East of Eden wasn't nominated for his Supporting Role. [Massey had been nominated - and lost - only once in his film career, for Abe Lincoln in Illinois (1940).] Although James Dean was Best Actor-nominated for East of Eden, he was NOT nominated for his more memorable, electrifying performance as Jim - a restless, brooding juvenile and new-kid-on-the-block in Rebel Without a Cause. Julie Harris, who played opposite James Dean as Abra in East of Eden, wasn't nominated. Love Me or Leave Me, with six nominations (and one Oscar win for Best Story), neglected to have its star Doris Day nominated for her role as 1930s torch-singer Ruth Etting. Bette Davis was neglected for her reprised role as Queen Elizabeth I in The Virgin Queen. The Honorary Award for the best foreign language film, awarded to Samurai, The Legend of Musashi, should have been given to Henri-Georges Clouzot's psychological thriller Les Diaboliques (Fr.) instead.